Pretty Me Up! : EO Organics Product Reviews #2! EO Organics Product Reviews #2! You can check out my other EO Organics product reviews HERE! What I like most about EO Organics is the pricing! Organic products can get extremely pricey, yet EO seems to always keep their pricing very reasonable. These make GREAT gift ideas, for the holidays, birthdays, etc. The Hot Cocoa Mint Gift set includes a fragrant Room Spray and Multi-Purpose Soap. This rich and decadent Hot Cocoa Mint scent combines the finest rich cocoa beans and peppermint to create a mint chocolate sensation. This crisp and cool refreshing blend of pure essential oils is the ultimate guilt-free chocolate indulgence. At EO® we chose this ultra soothing and fragrant blend to Invigorate and Energize your spirits. EO®Multi-Purpose Soap is formulated to gently and effectively clean pretty much anything from your veggies to your automobile. Our extremely mild and richly foaming formula deeply cleanses and nourishes with pure and soothing botanicals. As always our Multi-Purpose formula is safe and mild for you entire family. Lavish your senses with the richly fragrant and healing essences of Lavender. Perfect before bedtime or anytime to refreshen and renew. EO® Room spray is naturally rich and soothing and freshens anywhere you are. Spray your room or your pillow and indulge in our unique Cocoa Mint essential oil blend. These are HUGE! I love their bubble bath products!! EO® Vanilla and Coconut with Tangerine soothing Bubble Bath gently cleanses with Pure Essential Oils. Our richly foaming Bubble Bath creates lush and long lasting bubbles to pamper and indulge your skin. Our proprietary EO® Replenishing Complex artfully blends Papaya Enzymes, Mango Antioxidants and Jojoba to renew skin. Our Coconut Cleansing Complex gently cleanses without drying. Glycerin, Rice Proteins, Allantoin, Panthenol and Vitamin A, moisturize, hydrate and nurture skin. Organic Tangerine Essential Oil refreshes and uplifts; Organic Coconut Milk and Vanilla pamper skin. EO® Moisturizing Complex with Papaya, Mango and Jojoba protect from oxidative damage and replenish skin balance. Vitamin A improves skin elasticity with powerful antioxidants. EO® Rose and Chamomile soothing Bubble Bath gently cleanses with Pure Essential Oils. The proprietary EO® Rejuvenating Complex combines Marshmallow, Jojoba and Lemon Balm extracts which are renowned for softening the skin naturally and are ideal for irritated and sensitive skin. Our richly foaming Bubble Bath creates lush and long lasting bubbles to pamper and indulge your skin. Our Coconut Cleansing Complex gently cleanses without drying. Glycerin, Rice Proteins, Allantoin, Panthenol and Vitamins A and E, moisturize, hydrate and nurture skin..
Aromatic Precious Rose Essential Oils and Chamomile combine to nurture and pamper skin. EO® Softening Complex artfully blends extracts of Marshmallow and Lemon Balm and Organic Jojoba to deliver exceptional skin softening and soothing properties. 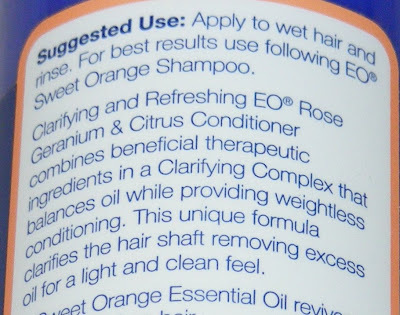 Clarifying and Refreshing EO® Sweet Orange Shampoo combines beneficial therapeutic ingredients in a Clarifying Complex to gently cleanse hair. This unique formula clarifies the hair shaft removing excess oil for a light and clean feel. Sweet Orange Essential Oil revives and refreshes hair. Witch Hazel deeply cleanses increasing blood flow and delivering nutrients to enhance natural hair growth. Neem Oil addresses dry scalp while resulting in shiny, stronger and silkier hair. Fenugreek, Orange, and Lemon Extracts combine to clarify hair alleviating excess oil build-up. At our family Christmas dinner, everyone came out of the bathroom (after washing their hands) saying "I love that hand wash! Wow! "- I thought it was so funny, because it's just a hand wash. However, it makes your hands soft, not dry- and it smells AMAZING- something that the whole family loves! Our fun and richly foaming soap cleanses and nourishes right out of the bottle for even the most sensitive skin with pure and soothing botanicals. Organic Tangerine artfully blends with Organic Coconut Milk and Vanilla to nurture and refresh skin. Organic Tangerine refreshes and uplifts; Organic Coconut Milk and Vanilla pamper skin. pH Balanced and Biodegradable. Great for the whole family. Coconut cleansing complex creates gently cleanses without drying skin. Winter Solstice is celebrated as a turning point. As the shortest day of the year, it marks the return of the sun. In honor of the returning light, we've created a limited edition Hand Soap. An evocative mix of organic herbs, uplifting organic Essential Oils of Peppermint, Fir and Pine and therapeutic ingredients is in this naturally rich and fragrant EO®Hand Soap. Our therapeutic ingredients will keep your hands happy and healthy through the season. This concentrated and moisturizing formula is pH balanced to effectively cleanse without drying out your hands - ideal for the entire family. This was my favorite! My whole family used this up in like a week because it made our hands smell sooo good! lol! I keep this at my makeup desk. I always sanitize my hand with this before touching my face. I love that this hand sanitizer leaves a light and relaxing lavender scent on your hands and fingers. This is the only hand sanitizer that doesn't dry out my hands. LOVE IT!! Sanitizes and moisturizes without water. The organic way to clean your hands and stay healthy. Picture this - There were two hands and zillions of germs. Each hand busy, doing all of the things of the day and zillions of germs trying to stay involved in whatever is going on. Using EO Hand Sanitizer keeps both hands refreshed, healthy and clean while keeping germs out of the picture. EO Hand Sanitizer--the organic, plant-based alternative to chemical laden hand sanitizers. Organic Lavender Essential Oil is naturally cleansing and soothing. Organic Alcohol (non-GMO) sanitizes on contact. Soothing Jojoba nourishes and moisturizes. Not tested on animals. Luxurious and naturally fragrant bath salts made with pure, therapeutic-grade essential oils. The ideal get away from it all. This intoxicating blend of vanilla, coconut and tangerine is the escape. California Sun Dried Sea Salts rich in calcium, potassium and magnesium add valuable trace minerals to the bath, softening the water naturally and gently cleanse the skin. Himalayan Pink Salt, an exotic fossilized marine salt formed more than 250 million years ago contains 84 rich elements and minerals including calcium, magnesium, potassium, copper and iron. These luminescent Pink Crystals are renowned for their detoxification properties as well as their ability to stimulate the circulation and promote relaxation. I really like this shaving cream- it's rich but not overly so. It smells soothing and calming. Highly recommended! This Rich, Moisturizing Shave Cream provides a clean, smooth shave while invigorating and toning skin. Natural surfactants hydrate and soften stubble and provide a rich, low sudsing lather while pure essential oils calm and balance skin. Luxurious Panthenol, Organic Jojoba Oil and Olive Wax combine to form an ultra moisturizing blend. This Paraben Free therapeutic Shave Cream contains Soy Proteins, Aloe Vera and Vitamins A& E to aid in tissue repair and improve skin elasticity. Lavender and rich Jojoba balance and naturally renew skin healthy on a daily basis. The Ultra efficient packaging allows for 98% chamber evacuation.